I seem to be in “clerical” mood these days – maybe it’s Lent, maybe it’s just chance or fate – but, after last week’s post on Nuns in Black and White I am now going to recommend a mystery series that has, as one of it primary characters, an Episcopal priest. This series has no”official name” – it is just called the Clare Fergusson / Russ Van Alstyne series. 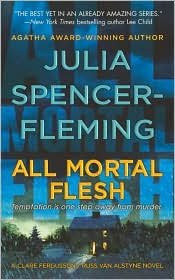 It is written by Julia Spencer-Fleming and the first book in the series is In the Bleak Midwinter. Anyone who has attended a Christian church during the Christmas holidays might recognize the title as belonging to a fairly subtle, but very beautiful hymn of the same name. The lyrics continue “frostly wind made moan. Earth stood hard as iron, water like a stone.” This calls to my mind the cold and desolation that can be winter and it is an appropriate title for this first series entry. The whole series takes place in Millers Kill, a small town in the Adirondack’s region of upstate New York. Clare Fergusson is a newly ordained Episcopal priest and a former Army helicopter pilot (talk about interesting combinations). Russ Van Alstyne is Chief of Police and not at all sure what to make of this “lady priest.” I began reading In the Bleak Midwinter a while back and did not finish. It did not grab me, the way I feel a mystery should. However, I just finished reading All Mortal Flesh (another hymn lyric, by the way) – 5th in the series – and I could not put it down.